Here are the full patch notes for PVP Season 8 of Marvel Avengers Alliance. There are a series of buffs and nerfs to several heroes and a serious buff to Tacticians that make them the suit of choice right now (they now gain an extra turn when attacked by a Blaster - max of one extra turn per round). We are introducing a new lockbox villain collection with PvP Season 8. Juggernaut will be available to users who complete the Unstoppable Lockbox collection. These lockboxes are awarded to players who compete in PvP Season 8. Players will receive 1 lockbox each time they win a fight, up to 5 each day. These lockboxes are also available on the PvP daily spin. In addition, a small chain of side quests is available to players who participate in PVP which awards a considerable sum of lockboxes upon completion. Passive : Get Outta My Head! Action 3: I’m the Juggernaut! The Player vs Player section of MAA has been completely visually overhauled. We believe it makes for a tighter and more coherent experience, and it will lend itself better to the next major PvP update: Separate loadouts for Missions and PvP. Coming soon! Tasks can now be seen in the Player vs. Player section. Class bonuses will not trigger on Quick Actions for any class. The Flight Deck now has an option for sorting heroes! Fixed an issue with the order heroes are displayed in the flight deck UI. The order of heroes should no longer change when you deploy an individual hero from your roster. Removed “Mindbenders” and rolled all psychic characters into “Mind Games”. Fixed an inconsistent experience in the UI upon entering the team management screen. When selecting the “Team Management” page from the mission select screen, any character that needs training will be selected as opposed to your agent. Corrected a task sorting issue with the optional side quests associated with Spec Ops. Side quests should no longer sort to the top of the task list above the Spec Op tasks. Helicopters should no longer appear in strange parts of the map canvas. When changing out heroes in the pre-fight screen, the character selection frame should now display the proper page. Health and Stamina are no longer abbreviated and are now displayed consistently throughout the game. New backgrounds can now be seen at the end of PvP fights. Fixed an issue that would sometimes cause the hero recruitment screen to take more than one click to close after a deploy. When customizing your avatar under the team management page, if you select another hero, the customization screen will properly dismiss. Force Field generator and other shield causing statuses should now have the proper sound effects when the status appears on the Agent / Hero. Damage Amplifier no longer applies the visual effect to the Agent and now properly displays on the targeted enemy. Sword of Barony will no longer proc a heal on a target that is not bleeding. 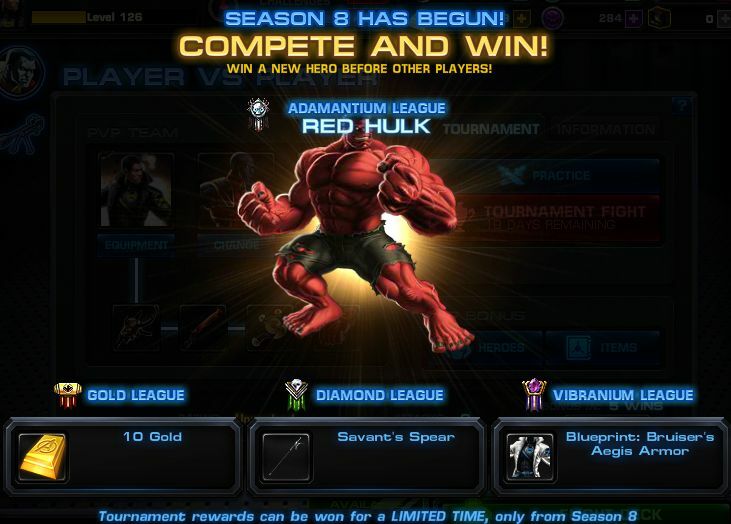 For season 6, those users who finished the season with an ELO between 1617 and 1619 showed in the UI as if they qualified for the reward, but this was a rounding error for adamantium only. They will be awarded Fantomex if they don't already have him. In all cases, the league they finished in will be updated to reflect the reward given. We recently introduced a new type of Iso-8 to Marvel: Avengers Alliance called “Reactive Iso-8.” This new Iso-8 works similar to customized agent gear, in that it is always valuable for a player to obtain since the power is set based on the agent’s level. With this new addition the time has come for us to sunset the percentage based Iso-8 some of our beta players were able to purchase back in the beta event last year. If you are a user who happens to own some of these older Iso-8s, we will be replacing them with the same sub-type of the newer “Reactive” Iso-8.